Welcome to Alaska, our country's last great wilderness. Alaska has a well-deserved reputation as the supreme site for the ultimate nature adventure. This expedition has been our most popular trip since we began offering it in 1989. Unlike most tours to Alaska, this is an active, land-based, small-group learning adventure. Our leaders will help you discover the natural treasures in three of Alaska's National Parks, each with unique wonders. Denali National Park is the quintessential nature lover's dream. Here we regularly observe magnificent wildlife like grizzly bear and caribou, wildflowers adorn the alpine tundra, and the presence of Mt. 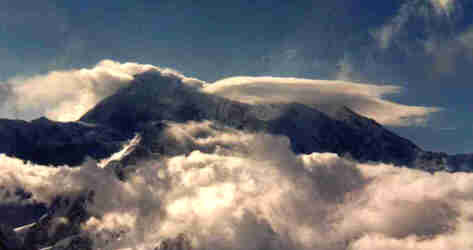 McKinley, North America's highest mountain, permeates all. Southeast Alaska boasts lush temperate rainforest, intertidal wonders, great whales, glaciers, and stunning beauty. Kenai Fjords National Park is lesser known but no less spectacular - with tidewater glaciers, marine mammals, and great seabird colonies. Our adventure begins with a scenic drive south from Anchorage, along the edge of Chugach National Forest and Turnagain Arm. We'll look for the usually elusive Dall sheep, which here are often seen feeding at close range. At Portage, we'll walk up a beautiful glacial valley for a close-up look at Byron Glacier. It is a grand scene, and the finer details of alpine wildlfowers only add to the ambience. 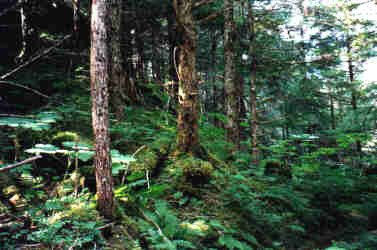 Later at Seward we'll take a stroll along the shoreline of Resurrection Bay, and see a lush temperate rainforest. Bald eagles are common here, and sometimes we've watched them feeding on spawning salmon. We'll take a boat trip in Kenai Fjords National Park, where the stunning seascape is enlivened with bald eagles, sea otters, sea lions, and enormous colonies of nesting marine birds. One island is the breeding place for over 20,000 horned and tufted puffins. We'll listen to the cracking sounds within a tidewater glacier, and watch for massive blocks of ice to calve, crashing into the sea. Next we'll visit Denali National Park, for an up-close encounter with true Alaska wilderness. Most Denali visitors only see the park in a limited manner, sitting on a shuttle bus that enters and leaves the same day. Our groups, however, stay at a fine lodge deep in the heart of the park. This is a far better way to really experience firsthand this exceptional place. Our driver will stop frequently stops to observe Denali's great wildlife - moose, grizzly, caribou, and Dall sheep. The excellent accommodations, service, and ambiance at our lodge belies the remote wilderness area you are in. Our day and evening (it is light late in the far north) outings are planned to introduce you to a sampling of Denali's many wonders. We'll enjoy walks on the tundra, where majestic views, flowers, and wildlife are legendary. We'll visit Wonder Lake in the evening, and look for alpenglow on Mt. McKinley. You can also fish, pan for gold, hear guest speakers, and take a plane flight for breathtaking views of McKinley, and the powerful glaciers of the Alaska Range. Our drive out of the park is filled with anticipation for more wildlife sightings. Will we see a moose grazing in a roadside pond? Will we encounter a wolf pack feeding on a caribou carcass, a grizzly sow with cubs searching for berries, or a wolverine bounding across the tundra? We can never predict exactly what we will see, yet these sightings hint at possibilities. We'll be dropped off at the train depot to board the historic Alaska Railroad, for a scenic ride to the colorful town of Talkeetna. Next we head south to the Southeast, the panhandle of Alaska, where Juneau and Tracy Arm are perfect places to culminate our Alaska adventure. You'll have the better part of a day to explore Juneau, Alaska's charming capital city. Options include a tram ride to the top of Mt. Roberts, a visit to the Alaska State Museum, downtown shops, and Mendenhall Glacier. We have added an unforgettable whale watch in the tranquil waters outside Juneau, for close-up encounters with humpback whales. 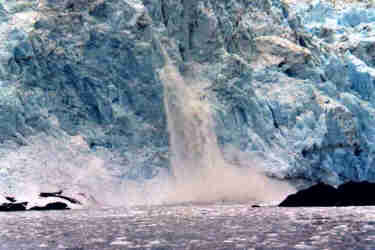 We'll also enjoy a day-long boat trip that will take us up Tracy Arm to the face of the Sawyer Glaciers, as we enjoy spectacular scenery and wildlife along the way. Your trip leaders, Steven Daniel and Gene Gartland, look forward to helping you discover the secrets of Alaska's wilderness. Steven is a trained naturalist with an MS from Cornell University. He has an abiding curiosity in all the world of nature, and a particular interest in high latitude plants and birds. He is a natural teacher, and enthusiastically shares his observations with our groups. This will be the 30th trip he has led to Alaska, and he is as excited to return as he was on the first ones. Gene has an MS in Geoscience from the University of Rochester. He enjoys leading groups to discover geological wonders in such places as the western United States, Hawaii, and Iceland. "Highlights? They were daily! First moose! Denali, wolverine, rainforest, tidal pool, calving glaciers, new friends......"
"It was an outstanding trip and we've been giving out your name and phone number nonstop since we returned." "All of my expectations for this trip were far exceeded. The opportunities and instruction provided were phenomenal. Every day was an amazing and humbling experience of the vastness and beauty of Alaska." "I had a great time...I enjoyed this trip much more than...last year's Smithsonian vacation in Africa." "The leaders were the very best. It would have been awesome just to see it all, but the leaders enriched the experience immeasurably." "Highlights were daily: Denali Park, Wickersham Dome, seeing Mt. McKinley out of the clouds, boat trips to glaciers, seeing so many birds and animals. Loved Resurrection Bay walk!" "The key to your success is the expertise, affability, and integrity of the leaders. Solid planning and attention to detail (with enough flexibility to adapt) are essential and were constantly in evidence."